Not to be confused with Ice Land. First appearance The Bird! The Bird! The Land of Ice is an expansive, snow-covered tundra made up of canyons, mountains, and the occasional plain located near the Mushroom Kingdom. Few creatures inhabit this land. Large rock and ice structures line the landscape, creating geometric shapes. While snow covers most of the ground due to the excessively cold temperatures in the area, the land itself is made of solid rock rather than soil, making the Land of Ice that much less inhabitable. However, Flurries, who are adept at living in snowy areas, travel quickly through the use of skis. Two Birdos also live on the highest mountain inside of an open-roofed house. Prior to the events of the The Super Mario Bros. Super Show! episode "The Bird! The Bird!," Cheepy's mother moved to the Land of Ice, where she raised her son, Cheepy by herself. The pair made their home on the highest mountain, where they lived comfortably regardless of the unforgiving climate of the area. However, Cheepy was eventually separated from his mother and was frozen in a block of ice. Cheepy's mother began to search the land ferverently, but with no success. After Mario and Luigi rescued Princess Toadstool and Toad from King Koopa for the first time, they fled from the occupied Mushroom Kingdom to the Land of Ice to seek refuge during the events of "The Bird! The Bird!" This was also the first stop on their journey for the magic to break Koopa's curse on the Mushroom Kingdom and to find another Warp Pipe to Brooklyn to allow the Mario Bros. to return. King Koopa, hot on their tails, followed with a portion of the Koopa Troop. Along with his traditional Koopa Troopas, Albatoss, and Bob-Ombs, Koopa also brought a large number of Flurries. Cheepy's mother spotted Mario, Luigi, Toadstool, and Toad as they passed through the land. She mistook Toad for her son and took him away to her home. Toads companions saw this as a kidnapping and set out to save him. As they climbed the highest mountain towards the Birdos' home, Flaky and his companion spied them and reported their location to Koopa. 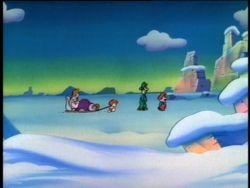 The Koopa Troop's Albatoss attacked using Bob-Ombs, eventually causing an avalanche. Narrowly escaping, they were reunited with Toad. The foursome then discovered Cheepy frozen in ice and thawed him out. As the Koopa Troop prepared for a second attack, Toad brought Cheepy to its mother, who offered to help them in return for finding her son. When the Koopas surrounded Mario, Luigi, and the princess, Cheepy's mother grabbed hold of Toad and flew him above the troops, where he dropped vegetables on them. As the counterattacks continued and intensified, Koopa ordered a retreat. Mario, Luigi, Princess Toadstool, and Toad then continued on their journey, leaving the Land of Ice. This page was last edited on March 20, 2019, at 20:06.